One of my various jobs at work is managing the library’s collection of periodicals. This keeps me splendidly up to date on all kinds of important stuff, like Britney’s latest debacle or who’s crushing on who this week. It also lets me peek at all the food magazines I don’t bother to subscribe to, like Gourmet and Bon Appetit (full disclosure: I do get Gastronomica, Saveur, Cook’s Illustrated, Simple Cooking and Food & Wine (hey, F&W was cheap)). When the latest issue of B.A. crossed my desk I picked it up and flipped through it to get rid of the subscription cards, and was immediately caught by an article on things to do with all the vegetables in your CSA box, by Molly Stevens of All About Braising fame. Not that we get a CSA box (nearly all the farms around here only produce May through October). Sigh. 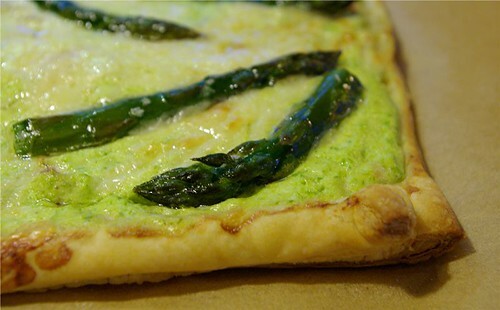 But anyway – the very first recipe was a tart made with asparagus, whole-milk ricotta and comte cheese, and I instantly knew I had to try it. After some careful searching at the co-op, we were able to come up with whole-milk ricotta, a small chunk of comte cheese, nitrate-free soppressata salami and a bunch of fresh, fat asparagus from California. I had a leftover sheet of Pepperidge Farm puff pastry in the freezer, so that was taken care of. 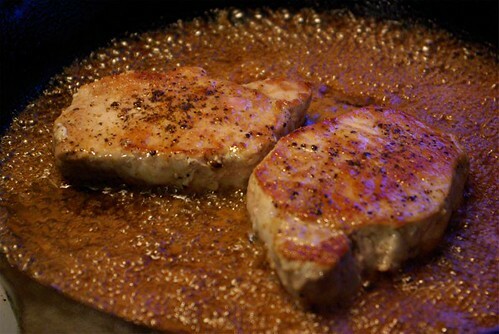 We also picked up a small pack of pork chops to give us some protein with our puff pastry. When we got home, I set out the pastry to thaw and put on a pot to steam the asparagus. 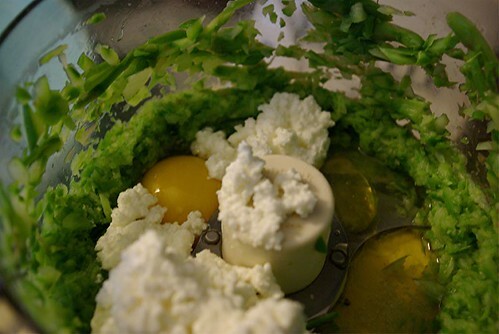 After the spears were just tender, I cut off the tips and mixed them with a bit of olive oil, then tossed the stems into the food processor and zizzed them up with an egg, half a cup of ricotta, a drizzle of olive oil and a pinch of salt. This all got scraped into a bowl and mixed with a third of a cup of grated comte and a few sheets of salami cut into slivers. 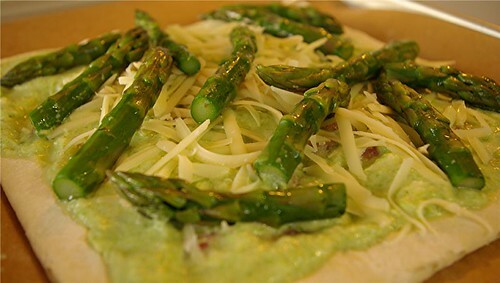 I rolled out the pastry and set it on a parchment paper-covered baking sheet, cut off the pastry edges and folded them over to make a thin edge, then scooped the asparagus-cheese filling onto the pastry. 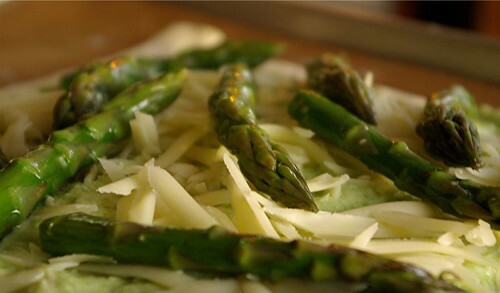 A little more comte was scattered on top and the oiled asparagus tips arranged artfully over all. The tart went into the oven at 400° and came out about 20 minutes later with the edges lightly brown and the filling just set. These were definitely worth mentioning – J seared them in a cast iron pan, then made a pan sauce from reduced apple cider and white wine that he then reduced down to a sticky glaze that was really amazing. The sweet/savory flavor of them really helped perk things up with the heavy cheesiness of the tart.